Orfit Eco is extremely well suited for large and/or rigid orthotic fabrication. It is a great material for elbow, forearm, wrist, ankle, and even back supports as well as anti-spasticity, long arm and lower extremity splints. Orfit Eco Black NS offers incredible ease of use. It has a non-sticky (NS) coating, unlike Orfit Eco, which has a powdered surface. Orfit Eco Black NS is a non-stick coated material. Offers excellent rigidity and has excellent resistance to fingerprints. High resistance to stretch and low drape. Low to moderate elastic memory. A temporary bond can be used during the moulding process to keep the material in place. No risk for accidental bonding. Permanent bond only when desired by dry heating and after removal of the coating. Allows to apply pressure during the fabrication of the orthosis. Easy handling and control of material during moulding. Very strong material which holds perfectly its shape against increased tone. The combination of the moulding capacity and a precise pattern design allows to mould conform to patient anatomy. 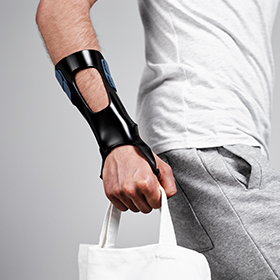 Orthoses are completely remouldable. Avoids waste of material. Excellent rigidity for large orthoses requiring full support: Knee and foot orthoses, Body jackets, Back supports. Specifically recommended to fabricate anti-spastic orthoses. Specific positioning of safe immobilization for every joint. There is a specific position of safe immobilization for every joint that requires careful consideration. Immobilization in a different position can lead to contractures, stiffness, limited range of motion and inadequate healing. A more-than-normal range of movement (ROM) in a joint. This can be localized to a specific joint, or generalized throughout the joints of the body. 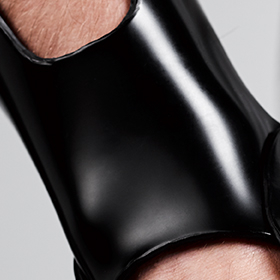 A most functional orthosis for most wrist complaints, especially for flaccid palsy. Very suitable as a basic orthosis to receive low profile extension outriggers. Produced in 4 sizes, one of which is for children (hand width: 40-50 mm). The purpose of this orthosis is to maintain the long flexor muscles stretched in order to inhibit the hypertonicity. 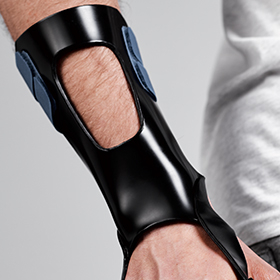 This orthosis has a radial bar for added strength on the radial side of the orthosis, ideal for patients with spasticity.